Note: This is Book 5 in the series and works mostly fine as a stand alone though is best read as part of the series to get the most out of it. This series continues to deliver! This time Kay Hunter has a cold case to investigate. She’s been on medical leave since the events of the previous book. Now that she’s back, she’s been stuck on desk duty while her boss, Sharp, is on suspension pending the outcome of a formal internal investigation. Kay and her team think that’s all bull and want to do everything they can to get their boss back. But first Kay needs Larch’s blessing. She and Larch have never seen eye to eye. I really started to form an attachment to Larch in this book, seeing the more human side to him. About a decade ago, there was a motorcycle fatality that was ruled an accident but Sharp has always suspected there was more to it. Now Kay and her team dig out the old reports and start re-interviewing friends, coworkers, and family of the dead man (Jaime). Everyone agrees that Jaime was an excellent motorcyclist but the weather was bad that night and even the best can make a fatal error. I did think this was the one weak spot in the story. The stats don’t sugarcoat motorcycle fatalities and sometimes the driver simply makes a fatal error. However, no one on Kay’s team really takes this possibility seriously and so they were predisposed to find another cause. They do spend some time mulling over wildlife or debris on the road, saying that if it had been a rabbit, they would have found the carcass on the side of the road. As if no predators might come along and make off with it…. Anyway, this one little weak spot didn’t ruin the book for me. Jaime’s parents (Michael and Brigit?) still live on the family farm. His twin sister Natalie is nearby as well. He worked for the military so Kay and her team dig into his activities and discover a surprise! The more they look into this matter, the more it looks like someone put the pressure on to rule Jaime’s death an accident. Towards the end, Kay is hot on the trail of one of the bad guys and she and another cop enter a house with just their wits and expanding batons. Yep. Now if I hadn’t recently watched Hard Sun and seen just how efficiently vicious a trained person can be with an expanding baton, I would have called Kay a twit for going into an unknown situation without some more serious hardware. The end of the story had me raising a pint for Kay and her team. I’ve come to really enjoy this series and this book is another worthy addition. 5/5 stars. 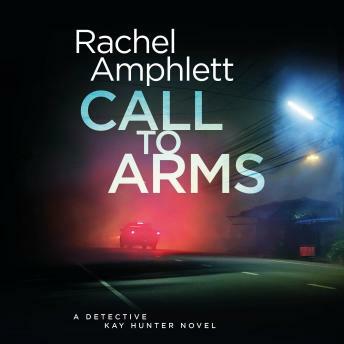 The Narration: Alison Campbell has turned out to be a good pick for this series. Her performance needed a little polishing with the earlier books but with this one she has given a great performance. She’s the perfect Kay Hunter. All her characters have distinct voices and her male characters sound masculine. Campbell also does a great job with all the emotions in this tale. There were no recording issues. 5/5 stars.